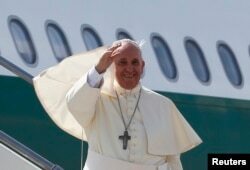 Pope Francis has arrived in Seoul Thursday marking the first trip to Asia by a pontiff in more than a quarter century. He will honor martyrs in South Korea who helped bring Catholicism to that country, but some Vatican watchers believe the visit is also intended to send a message to China, where the Christian population is growing rapidly even though it is officially an atheist nation. Christianity has a long and difficult history in China - since it was brought by European missionaries who followed in the wake of British gunboats in the opium wars of the mid-19th century. A Chinese aphorism against conversion holds that “one more Christian is one less Chinese,” and Christianity is often presented as alien to Chinese culture. But experts note that Marxism, not to mention Buddhism, also began abroad, and Christianity has grown since the death of Chairman Mao in 1976 and the end of his “Cultural Revolution,” which sought to cleanse society of religion and other supposedly bourgeois practices. Lately the pace of growth has been breathtaking. The number of Christians has more than tripled since 1996 when it was estimated at 10 million. Pew Research Center puts the current population at twice that, at 60 million. And one expert, Purdue University professor Fenggang Yang, even goes so far as to predict that by 2030 China will be the largest Christian country in the world. While many question Yang’s prediction - conversions are proceeding apace. Vala of Loyola University says a sizable share of the current Christian population is made up of people who have belonged to the faith for less than 10 years. And there has been tremendous interest among intellectuals. Author and dissident Yu Jie converted around a decade ago before coming to the U.S. He traces Christianity’s rise to the bloody suppression of the democracy movement in Tiananmen Square in 1989. “After Tiananmen, no one believes the Chinese Communist party and its Marxist and Maoist theories,” he said in an interview at the Washington Harvest Christian Church in Chantilly, Virginia. Increasing urbanization has uprooted Chinese from rural traditions while civil society is lacking in the cities, Yu said. Videos have been circulating of dozens of crosses being removed from house churches as well as outright demolitions. Chinese authorities say the bulldozing was prompted by zoning violations. In Washington, the former pastor of Harvest church, Zhang Bo Li, spoke of a systematic crackdown on Christianity in China. “The stronger the persecution, the purer the church will become. The more persecutions, the more lively the churches will become,” he said. Pope Francis waves as he boards his plane to leave for his pastoral visit to South Korea, at the Fiumicino airport in Rome, Aug. 13, 2014. The last pope to visit East Asia was John Paul II, who went to Korea in 1984 and 1989. He is often credited with speeding the fall of Communism in Eastern Europe. Yu, the author, argues that South Korea can serve as a model for China because the development of Christianity there helped foster democracy, and did not destroy the local culture.